Heat 1 tbsp oil in a pan and add cumin seeds and fenugreek seeds and saute. Add chopped ginger and garlic and saute for a minute. Then add grated coconut and roast well. When it starts to brown, add cloves, cinnamon and cardamoms and saute. Add poppy seeds and pepper corns and roast well. Reduce flame and add chilli powder and coriander powder and mix well. Switch off the flame and when it cools down, grind it along with fried onions to a smooth paste and keep it aside. Heat 1 1/2 tbsp oil in a thick bottomed pan and add finely chopped 2 medium onions and saute well. Add green chillies and turmeric powder and saute. Add cleaned chicken pieces and salt and mix well for 5 minutes. Add ground roasted paste and mix well. Add chopped tomatoes and 1- 1 1/2 cup water and stir well. Cover and cook till chicken is cooked well. 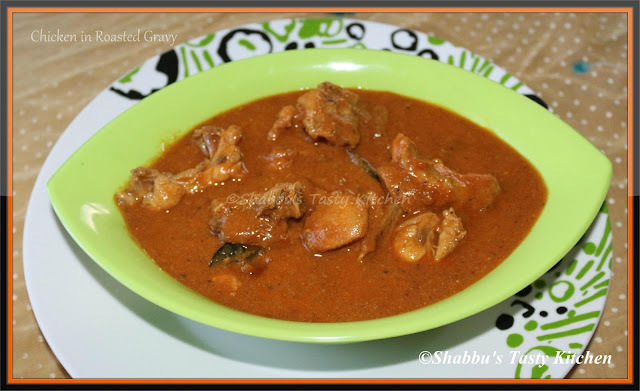 Check salt and adjust the gravy by adding hot water..
Fingerlicking chicken gravy, the colour of the dish itself is just droolworthy. Thank you everyone for your lovely comments..